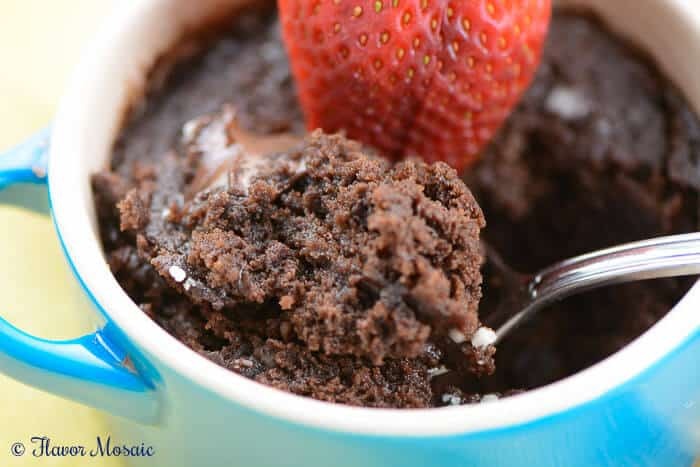 Chocolate Mug Cakes for Two are quick and easy, delicious, portion-controlled, chocolate desserts for you and your sweetheart that are perfect for Valentine’s Day or any day you would like a mini chocolate cake for one or two. With Valentine’s Day around the corner, I’m starting to plan our menu. One thing I know is that Mr. Flavor Mosaic will want is a chocolate dessert, usually a decadent, over-the-top chocolate dessert. But let’s face it, we don’t need that many calories. 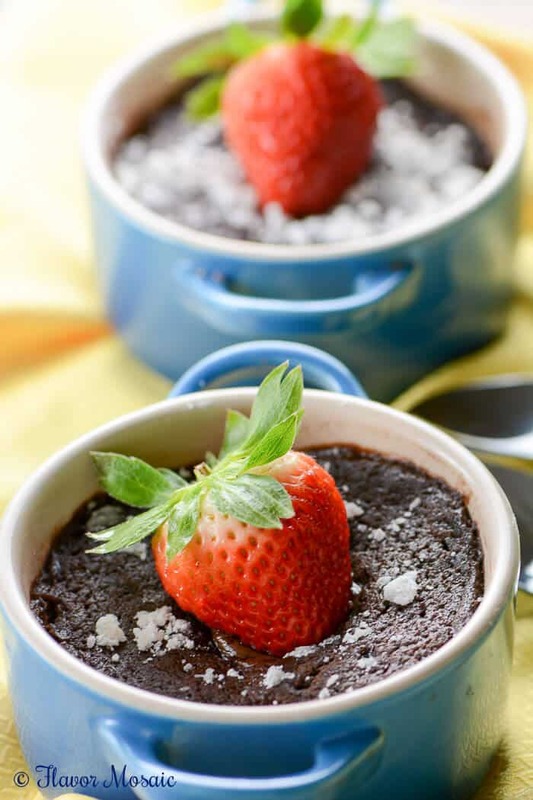 However, we still want a chocolate dessert for Valentine’s Day. So I have found a way to have our cake and eat it too! Mini size it! I’m sure you have noticed any time you look at Pinterest, the the trend is to serve mini sized desserts. I personally think that is a good trend. However, I don’t want to pay outrageously high prices for a mini dessert at a fancy restaurant, when it is so easy to fix at home. If you have 5 minutes and basic pantry ingredients, you can make these cakes for you and your special someone. Or if you want to make it just for yourself, I completely understand. 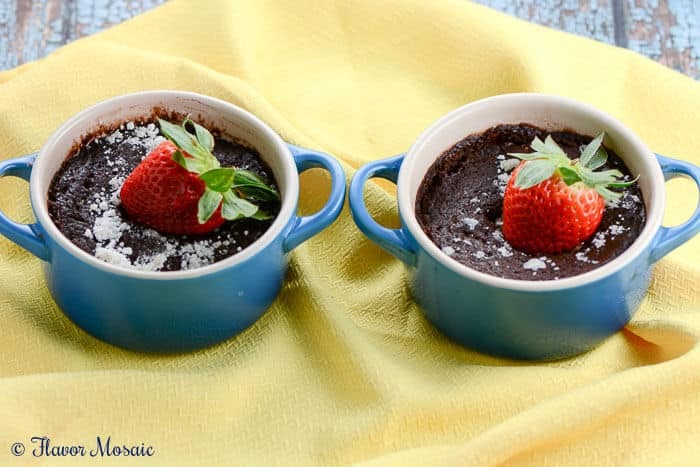 And when you take it out of the microwave, you will each have a mug of deliciously warm, moist, chocolate cake. 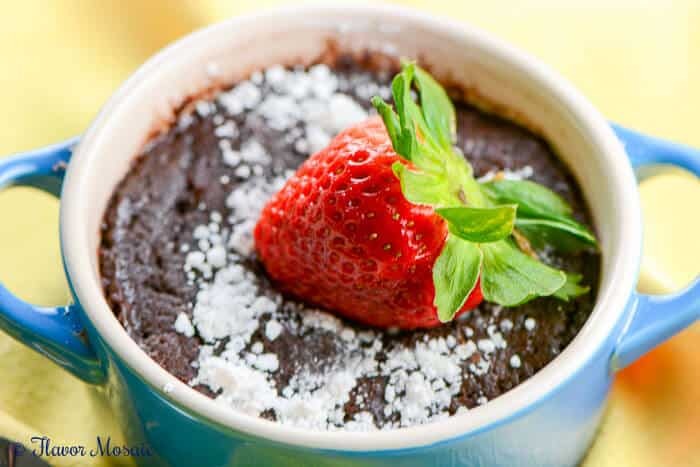 Now whether you share or just have one chocolate mug cake for each hand is your business. I won’t tell. In the instructions below, I break it out to make each chocolate mug cake individually, in case you only want to make one mug cake. 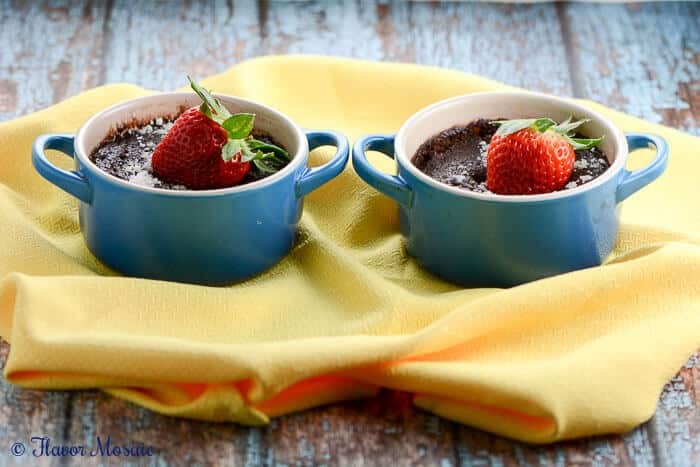 However, if you are making two mug cakes, you could also mix the first 7 ingredients in a bowl and then divide the batter evenly into the two mugs. It works well either way. 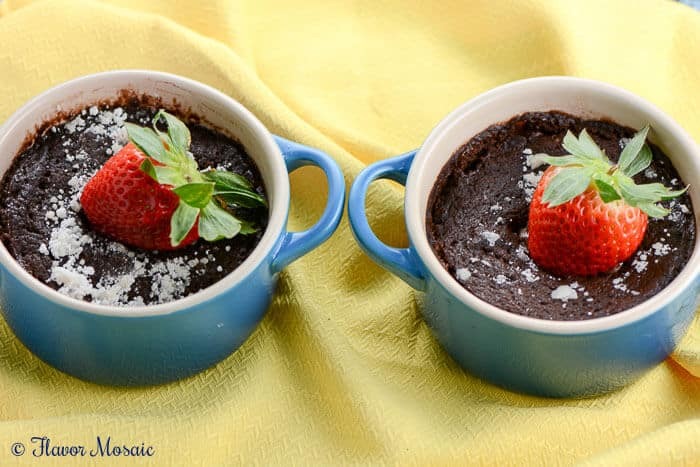 With whom will you be sharing these deliciously warm Chocolate Mug Cakes for Two? 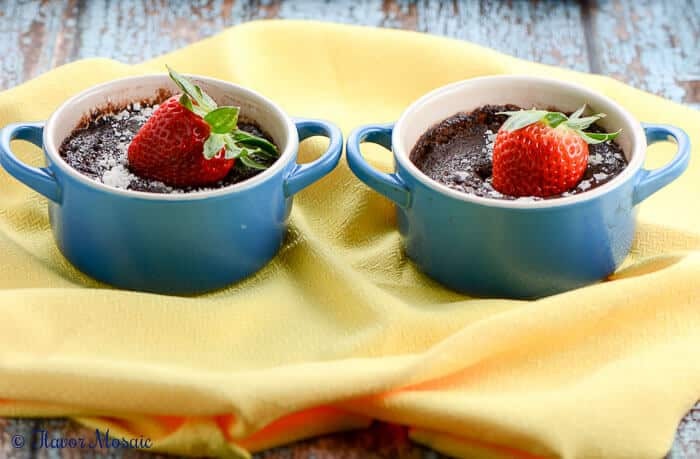 These are delicious, portion-controlled, chocolatey desserts for you and your sweetheart that are perfect for Valentine's Day or any day you would like a mini chocolate cake for one or two. In one mug, using a spoon, stir together the first 7 ingredients. Add the mini chocolate chips on top in the center. No need to push down. Repeat step 1 in the second mug. Remove from microwave. Sprinkle a teaspoon of powdered sugar on top. Add a strawberry to garnish, if desired. 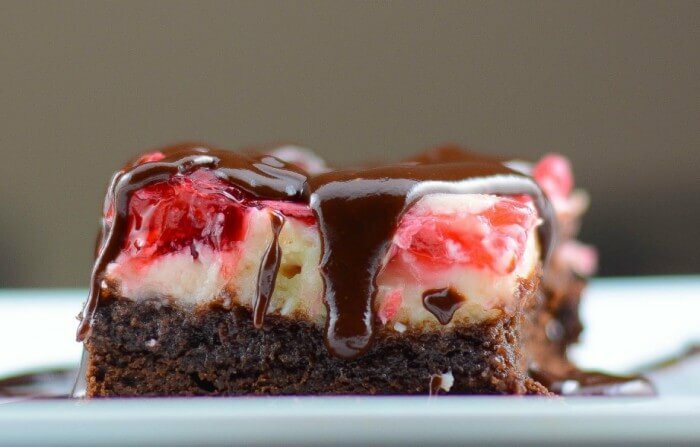 If you like this recipe be sure to check out other desserts, such as these Cherry Cheesecake Brownies. 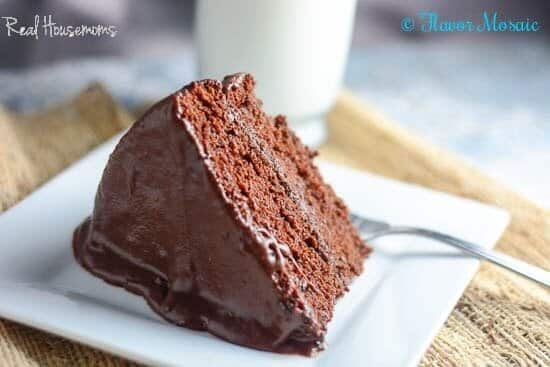 Or you may like this Moist Chocolate Layer Cake. 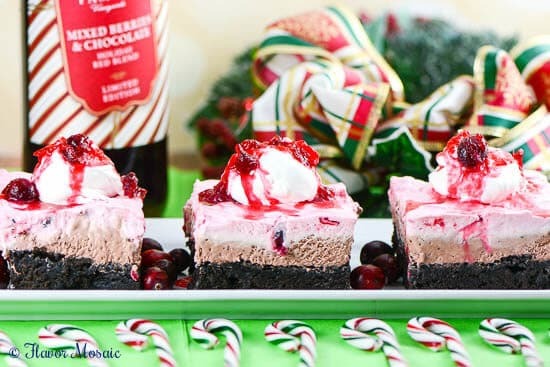 How about these Berry Chocolate Mocha Mousse Desserts? 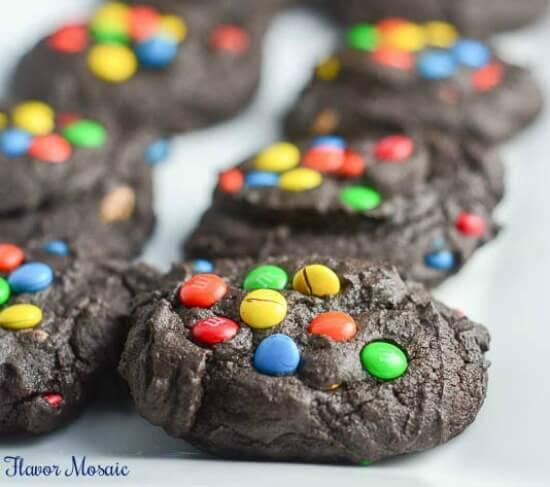 Or how about these Mini M&M Chocolate Cookies? 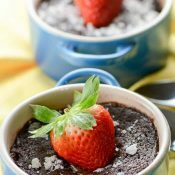 For more chocolate dessert recipes, go to Flavor Mosaic’s chocolate dessert archive. For more Valentine’s Day recipes, go to Flavor Mosaic’s Valentine’s Day recipe archive. Oh my, your desserts looks sinfully delicious! Thank you for linking up to Wordless Wednesday this week. Come back next time, please! What a perfect treat to share with a friend on a cold winter day. No risk of over indulging since it’s just enough for two! Thanks so much for linking up the recipe at the This Is How We Roll Thursday link party. Thank you Diane! I’ll check it out.